Crisis Looms In Aleppo As Syrian Troops Cut Off Last Road To Rebel-Held Areas : The Two-Way Losing this crucial supply line means that rebel-held areas of the Syrian city are completely cut off. Now, supplies are dwindling and activists are sounding alarms about a humanitarian crisis. 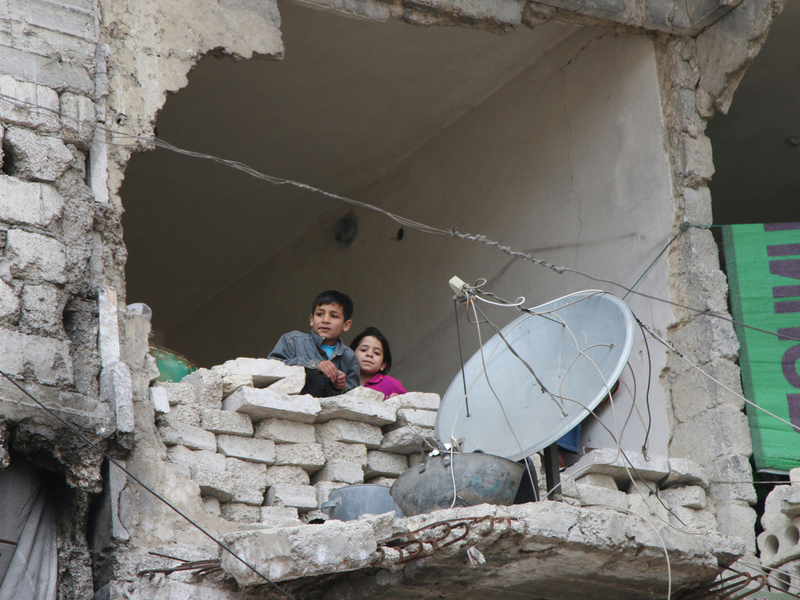 Children peer from a partially destroyed home in Aleppo, Syria in February. Syria's largest city used to be its economic locomotive, now it is has become an emblem of its stalemated civil war. Forces loyal to the Syrian government have seized control of the last road into the rebel-held areas of Aleppo, according to the Syrian Observatory for Human Rights. "The road was a supply line that connected rebel-held territories to the northern countryside that leads to Turkey. Activists say this will create a humanitarian disaster because without the road there is no way to get humanitarian aid or supplies. "Aleppo was once a booming hub for business and industry but now it's a battleground divided between government-controlled areas on the west and rebel held areas in the east." The U.N. says that "nearly 300,000 people rely on the Castello road for travel, food and medicine," according to The Associated Press. "Aleppo is under full ground siege after the regime took some points on the road," Aleppo-based activist Bahaa al-Halaby tells the wire service. The forces loyal to the government had captured areas overlooking the road "had already captured ground overlooking Castello Road nearly two weeks ago, effectively shutting it down - although a local opposition figure said a few supplies had still been getting through," as Reuters reported. Multiple parties to the Syrian conflict have besieged and starved civilians over the course of the war, which is in its sixth year. "The UN's Human Rights chief warns the deliberate starvation of Syrian civilians by government and opposition forces may constitute a war crime," as Lisa Schlein tells our Newscast unit. "The country is already a gigantic, devastated graveyard," the high commissioner's spokesman Rupert Colville says, "but it is in the power of both attacking and defending forces, and their foreign backers, to minimize further civilian casualties." As Schlein reports, Colville warns that "supplies of food, water and medicine are running out in Aleppo."